10:41 if you look at the yellow MoonTide Harmonic grid lines down, we spanned 4 of them-a common "range"
10:20 I was looking for a pullback to 1170, but did not expect it in the first hour! 11/19/2004 1:08:29 PM Mountain mjs:: So how does this week setup the next week or more. Looks like 1189 was the top and we are now forming up the new CS down. But on a longer term basis if you use the NYA we broke out of a flag from the beginning of the year and punched through 3 resistence levels. So pull back and then assault on 1250 for the SP or pull back to 1050? 11/19/2004 12:55:24 PM Mountain mjs:: My best fit is on the 9 day with the smalest CS which gives this leg about 2.5 days and shows a lower close as the most logical still a lot of space to move around in out in the Arizona territory on that horse. 11/19/2004 11:38:22 AM Mountain mm:: Looks like a CIT right on Al's 1:15, on the minute. 11/19/2004 11:12:36 AM Mountain wlj:: MJS, planets in our galaxie effect things in our galaxie as we see with markets on earth.... galaxies effecting other galaxies just seems like the same thing on a larger scale...more wheels with in wheels......the universal clock. 11/19/2004 10:59:05 AM Mountain TG:: 12:26 natural time low for the day. A few intraday cycle seem to have turned up. 11/19/2004 10:00:10 AM Mountain mjs:: Perhaps a far out thought: In music you modify harmonics by changing the time of notes and the length of the note (A,B,C etc.) so the problem in getting a good fit for our fractal is that we do not modify time like you can in music. If todays action was music you would have a bunch of 1/16 and a few whole notes but you would be able to recognice the Major scores like C major of D minor and there are only a limited number that fit together to have harmony. If you do it otherwise it sound horrible and no one listens to it. So how do we modify time or the way we count it to reveal the natural rythum? 11/19/2004 9:30:23 AM Mountain wlj:: sp cycle guys were calling for 15 thru 19 to be short term hi.... fib guys said 17 thru 18. 11/19/2004 9:24:12 AM Mountain TG:: If we're going to get a good oob buy for 11:50 tide time, then I'd think either the 11:22 tide 32 time or the 11:32 natural time would mark a low. 11/19/2004 9:21:38 AM Mountain TG:: Nov 17 time price square, 769 calendar days from the Oct 10 2002 SPX 769 price low providing a little hick up so far. 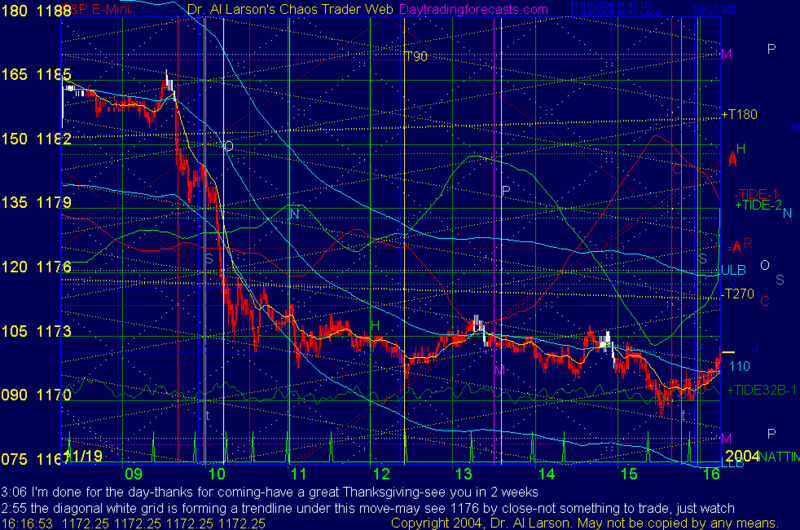 11/19/2004 8:45:03 AM Mountain mjs:: I am getting my best ideas from the 9 day chart and its pivots. Yest'd I ran my life feed at 60 min and that makes a good case for a mirror image of the trip up. Time will tell. 11/19/2004 8:19:29 AM Mountain mjs:: Well got to my 1176 projections and on time too. Now sideways or up so it stays in tune. 11/19/2004 8:13:56 AM Mountain wlj:: mjs, big run up since oct 25 low and little pull back seems bullish as does 300 to 500 new highs to single digit new lows of late. as al says 1190 will tell the tale. 11/19/2004 8:00:01 AM Mountain mjs:: NO! Breifing.com says its profit taking. Everything is under control you can go back to your seats. 11/19/2004 7:50:04 AM Mountain wlj:: the chrion trap door company. 11/19/2004 7:36:30 AM Mountain mjs:: All the advisor services think this is a turning point. Some are looking up to 1250 and some down to 1050 by Jan 05. It does look like a balance point here. None of the Astro seem to have kicked in we passed the Eclipse, Saturn, Uranus, and a new Moon on our way to here. So whatever it is it is powerful. 11/19/2004 7:07:15 AM Mountain wlj:: new exchange traded fund started trading yesterday. syb.= GLD follows the price of gold. 10 times the price = the price of gold.